My son Garrett is 9 years old. Like most tweenagers these days, he is rarely seen without an iPad in one hand and a game console in the other. But as he gets older he is getting harder to buy for because toys just don’t interest him any more. He loves playing Roblox on his iPad with his buddies and every once in a while I’ll catch him playing with his Grossery Game figures. But mostly it’s all electronic, all the time. So. I decided to compile a list of ideas for all you moms out there who are trying to figure out what to buy those kids who have outgrown the toy phase of life. Take a look at all of these unique and traditional gifts for gamers! 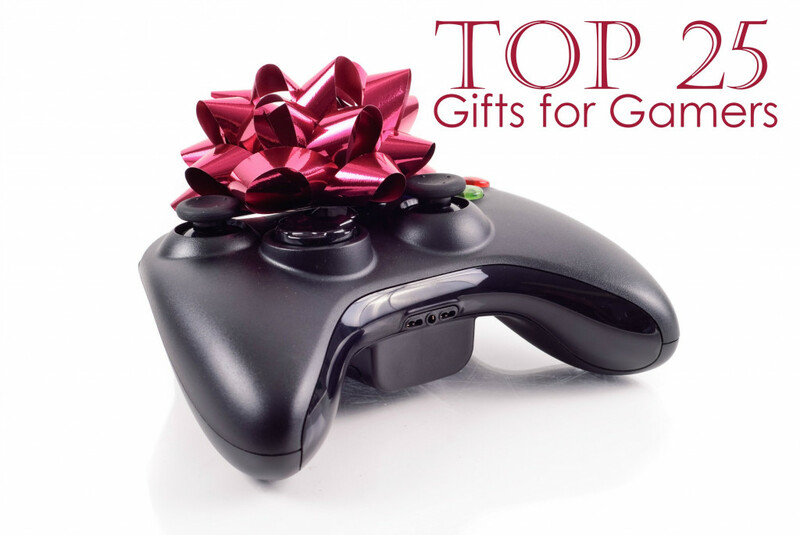 From stocking stuffers to the ultimate gamer gifts, this list has a little bit of everything. Prices vary to cover any sized budget. If you are looking to really spoil a gamer this year, turn your gift into a gamer’s gift basket by adding some other goodies such as their favorite energy drink, snack, and candy. Don’t forget about the gaming memberships! Gamers always need a way to connect and play online. Super Mario Bros. Tin with Coin-Shaped Candies $6: After the yummy candy is all gone, you have a cool tin to store treasures. Game On Ornament $9: Deck the halls with this gamer ornament. Game Over Coffee Mug $10: Love this mug! It is the perfect gift for any gamer. Video Game Socks $10: What a fantastic stocking stuffer idea! KEEP OUT Gamer At Play ENTER At Own Risk Novelty Tin Sign $10: Add a little whimsy to the gaming room with this tin sign. I Don’t Get Older I Level Up T-shirt $12: This is the perfect gamer t-shirt. Game Boy Lunch Box $13: Pack your lunch in style! Cell Phone Case $15: Sport your love for gaming with this cool NES controller cell phone case. Gamer Girls Need No Rescuing T-Shirt $15: Adorable shirt for all of the gamer girls out there. Starry Night Piranha Plant $15: What a great way to decorate any room in the house. Love this spin on Van Gogh’s Starry Night. Gamer Chip & Dip Dish $16: Serve your guests a yummy snack with this gamer dish. 3D Glasses Virtual Reality Headset VR Box for Smart Phones $16: Give the gift of virtual reality without a hefty price tag. Super Mario Ugly Sweater $19: Perfect attire for an ugly sweater party. FreezerBoy Refrigerator Magnets $20: Turn your plain white fridge into a fun reproduction of the original Game Boy. Gaming Headset $23: Bring games to life with sound that won’t disturb your whole household. Tetris LED Stackable Puzzle Desk Lamp $27: Light up your life with this stackable Tetris lamp. Gaming Magazine Subscription $34: Great for the ultimate gamer who stays informed with the latest gaming trends. Logitech Gaming Mouse $85: Stay on top of games with this sophisticated gaming mouse. Gaming Chair $189: Any gamer will play their best when they have a comfortable chair to lean back on. Nintendo 3DS $196: The Nintendo 3DS was previously the choice for handheld game systems UNTIL Nintendo introduced the Switch this year. PS4 500 GB $288: Gamers can play exclusive games only available on this gaming console. Xbox One 1TB $320: You cannot go wrong with this price! Add a membership to Xbox Gold and your recipient will be set for the year! Nintendo Switch $299: Newly released in 2017, this is the latest and greatest in handheld consoles because it also doubles as a home console- you can switch back and forth between gaming at home or on the road with this all-in-one console. This is THE hottest toy of 2017 so if you have a gamer, this is probably at the top of their wish list. Cyber Power Gaming PC $589: If you have a little bit of a bigger budget, this is a great option. Asus Gaming Laptop $870: Virtual reality comes to life on this laptop. Titan Gaming Laptop $3,000: This is the ultimate gaming laptop. Start saving now! As you can see there is a HUGE variety of gifts for all your gamers out there. From creative Tetris desk lamps to consoles and socks, you are sure to find the perfect gift for the gamer in your life. What are you picking up to put under the tree this year? Happy shopping and gaming my friends! Omg, I love the post. I had no idea what to get for some of my family members and this post will make everything easier. Thanks! Thanks for sharing your helpful and valuable informative post. Can you tell me? What are good gifts for gamers?